Colnaghi & Co (active 1809-1835), Publishers. Artist associated with 100 portraits. After her death Prince Leopold retained his beloved status amongst the public as Princess Charlotte's 'afflicted consort', and continued to reside at Claremont. 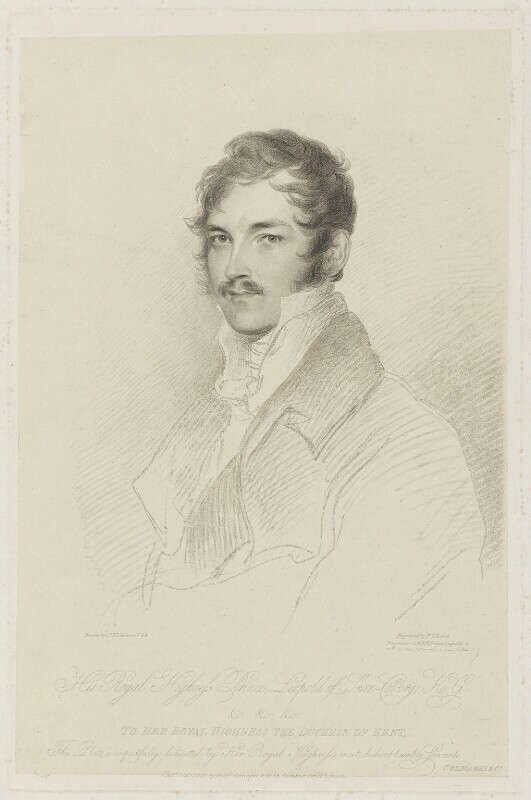 The emotional interview that had occurred between Leopold and Sir Thomas Lawrence, when Leopold had spoken heartbrokenly of her fine qualities while examining Lawrence's portrait of his wife, led to further commissions. During his initial visit to Claremont, Lawrence had made a sketch of Leopold, and this handsome engraving most likely reproduces the eventual outcome of that study. He later depicted the prince in his full regalia after he became King Leopold I of Belgium in 1831.